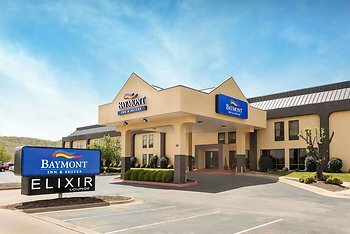 Hotel Baymont by Wyndham Fayetteville, Fayetteville, United States of America - Lowest Rate Guaranteed! With a stay at Baymont by Wyndham Fayetteville in Fayetteville, you'll be within a 10-minute drive of University of Arkansas-Fayetteville and Randal Tyson Track Center. This hotel is 1.5 mi (2.3 km) from Bud Walton Arena and 1.5 mi (2.4 km) from Baum Stadium. The friendly courteous staff was amazing! I will stay here again when it is possible. Logos, brands, and other trademarks featured within this site are the property of their respective trademark holders. These trademark holders are not directly affiliated with Hotelsone. Baymont Inns & Suites is a registered trademark.© 2001 - 2019 HotelsOne. All rights reserved.